1. Fold both pieces of orange felt in half and draw 1/2 a pumpkin centered around the fold. Cut out the pumpkin. One of the pumpkins will probably be a little smaller because of the thickness of the felt. You can unfold the felt and cut them so that they are more even. 2. Cut 2 different leaf shapes out of the green felt. Put a small drop of hot glue at the point of the leaf. Pinch both sides together to give the leaf some dimension. Repeat with the second leaf. 3.Fold the remaining green felt in half and cut 2 stems. To make the stem more ridgid hot glue both pieces together. 4.Hot glue both pieces of the orange felt together appoximately 1/4 inch in from the edge. LEAVE A SMALL OPENING. 5.Stuff the pumpkin with polyfill. Glue the opening shut. 6. Using the sharpee, draw the outline of the pumpkin where you glued the edges together. Add some pumpkin ridges with the marker. 7.Glue the stem to the BACK of the pumpkin. Glue the leaves to the front of the pumpkin near the stem. 8.Cut the eyes, nose, and mouth of the jack-o-lantern out of black felt. Hot glue them to the front of the pumpkin. 9. Wrap the cloth covered wire around the sharpee to make it curly. Hot glue it behind the stem and pull it to the front. Reshape it so that it looks like a vine. 10. Make small loops at the end of the 20 gauge wire, then wrap it around the sharpee. Carefully pull the wire into the shape of the hanger. Hot glue the hanger to the back of the pumpkin making sure you drench the loops in hot glue. This would be a wonderful activity for a children's party. 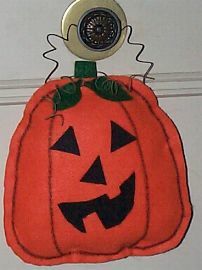 The pumpkins can be made up in advance and black peel and stick felt can be used for creating the Jack-O-Lantern.